National University NU Honours Admission Result 2018-19 is here. In this article, I am going to share the full process of collecting Bangladesh National University (NU) Honours 1st year admission result of session 2018-19. The result publishes date has been announced. In this article, I am going to share some exclusive trick about how to collect or how to check Bangladesh National University Honours admission result 2018. On the result day, the nu.edu.bd/admissions website will be may down for server problems. But here I am sharing some other ways to collect your NU Honours admission result 2018-19 session. It is very easy. Just follow the below method. Here is your NU Honours Admission Result 2018. National University Honours admission test result (1st merit list) to be published on 2nd October 2018 Monday at 4:00 PM on the official website www.nu.edu.bd/admissions. Once the result got published officially, then you can check it by online or mobile SMS. You may find your NU Honours Admission 2nd Merit Result here. Here I am sharing the full method of collect the all merit list Honours 1st year admission result 2018 of the academic session 2018-19. Let's see when to publish all merit list of NU Admission result of this year. How to Download NU Honours Admission Result 2018? I know it is very a common questions at all new examine who give admission test at the National University on this year. You can check your 1st merit list NU Honours Admission result in 2018 by the internet and mobile SMS. In below I am sharing all available method for check NU Admission Result 2018 - 2018. Now check recently published a notice about NU Honours 1st year admission test result. The online internet is the best way for collect any NU Results. In here I am showing you how to collect or download your NU Honours Admission Result 2018 (1st Merit list or 2nd Merit list) by the online internet. You know the result publish date has been published. On the result day at 4:00 PM you can check your result on the official website of National University Bangladesh www.admissions.nu.edu.bd. You can also find your result on the website also. Mobile SMS system is the another best way for check your National University (NU) Honours Admission Result 2018 for session 17-18. I know you're the very new examine of National University Family. That's why you don't know full processing of collect any NU Result through Mobile SMS. Don't worry guys, I am here. Follow below method for collect your NU Admission Result 2018. Example: NU ATHN 1245578 and send it to 16222 Number. I hope guys you understand how to get National University 2018 Admission Result for session 2018-19. You know Bangladesh National University is the second largest university in Bangladesh. Every year a huge number of students are admitted into National University Honours 1st year. Now time to get your Admission test result of National University Bangladesh. All examine will not give chance on 1st merit list. But they have also got a chance on the 2nd merit list. It is another opportunity for getting a chance on Honours 1st year admission. If you don't get a chance on the 1st merit list of Nu admission test result, then you may get change on the NU Honours admission result in 2nd merit list 2018-19 session. You should also find your National University Honours admission result in 2nd merit list here. National University Honours 1st year admission was started from 24th August to 15th November 2018. In this year total 5,31,000 candidates are applied for NU Honours 1st year admission. 1st merit list to be published on 2nd October 2018 and 2nd merit list date till not announced. 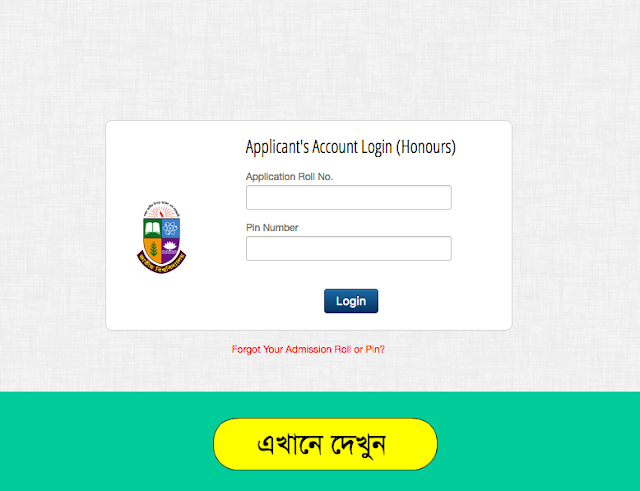 You can easily check or download your Honours admission result 2018-19 all merit list by nu.edu.bd/admissions. Honours 1st year all examine are very new. They haven't any proper idea about how to download NU Admission result 2018. If you have a question about NU Honours Admission Result 2018-19 then feel free to leave a reply on the comment section or you can also message us.